NameTagWizard.com started as the brain child of Bryan Croft, CEO of Holmes Stamp & Sign in Jacksonville, FL. A family business since 1954, the team at Holmes has always specialized in custom products. Name tags became a very big part of the business around 1970 and we soon gained a reputation of producing high-quality name tags in record time. Today our technology has evolved even further and our name tags are the best available anywhere. For the past 50 years of name tag production, most of our customers have ordered traditional engraved plastic name tags. In recent years, these have evolved to clean & refined laser-engraved styles, some including multi-color screen printing, typically for logos. As uniforms and suits became more commonplace, magnet backings soon replaced traditional single and double pins to avoid puncturing work attire. While many of our long-time customers still choose traditional engraved name tags, in 2015 we began shifting production to top-of-the-line full-color UV printing. Our new Roland VersaUV printer uses advanced application technology, specialized inks, and patented processes to produce the highest-quality, longest-lasting name tags we’ve ever made. High detail and precise color matching are now available at an unprecedented level. If you haven’t seen a UV printed name tag yet, order one today and compare to your current name tag. We guarantee you’ll never want to switch back! Have a large order? Contact our Customer Focus Department for a quote and we’ll send you a complimentary sample before running your order. If you’ve ordered from us before, you know that we’re about much more than name tags. In fact, our most popular and best-selling items are our professional quality photo ID cards. Customers in medical, security, technology, and countless other fields rely on photo ID cards to give an impressive public image. 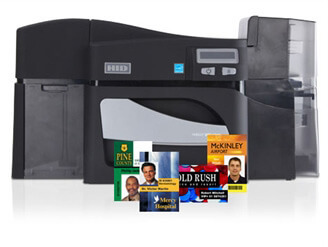 All of our photo IDs are created on the Fargo HDP5000, a top-of-the-line High Definition printer with enhanced security and quality features. All of our IDs can be enhanced with bar codes and QR codes for increased security. Outstanding image quality, vibrant colors, clear photos and sharp text & graphics are what you can expect when ordering a photo ID from NameTagWizard.com. 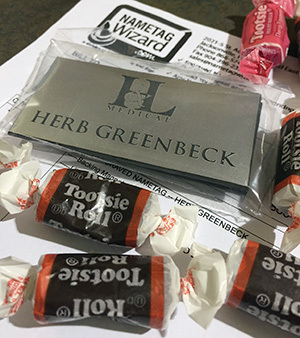 Last, but certainly not least, are our line of “other” products, such as desk name plates, cubicle and wall signs, custom buttons, name badge accessories, luggage tags and much more. If you haven’t seen these amazing products yet, be sure to take a look at them by using the menu or search bar above. Quality, reliability, speed and 100% made by hand in the USA, what more could you ask for? Shop at NameTagWizard.com today and experience the magic.